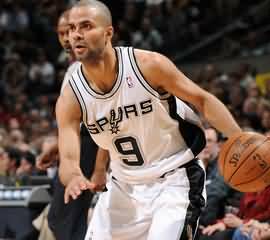 Coach Springer presents these scoring drills used by NBA All-Star Tony Parker (San Antonio Spurs). Diagram A. If Parker is able to turn the corner on the high pick and roll, he looks to get into the middle. He typically shoots a floater over the help defense. 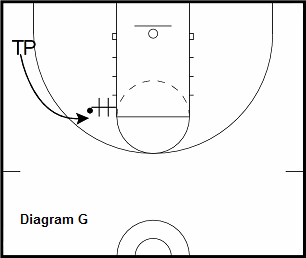 Drill: Use a chair for the screen and get into the paint for a floater. Make 20 going in each direction. 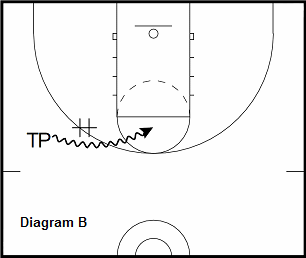 Diagram B. Parker takes a sideline pick and roll for a jumpshot at the nail. 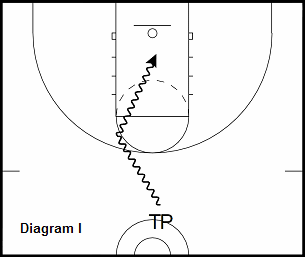 Drill: Make 20 jumpshots off the screen coming from both sides of the floor. If Tony can't get his shot at the nail he will hesitate and go into a drive to the rim (diagram C). 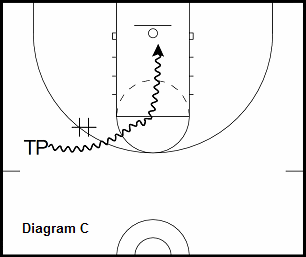 Diagram D. Parker's speed in transition is dangerous to any defender. 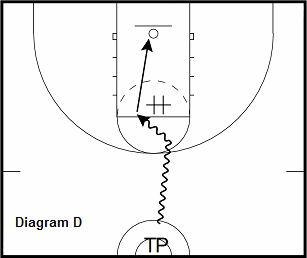 Tony will attack the defender, crossover, pick up the ball into a 2 step layup. 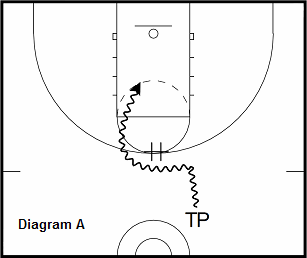 Drill: Start at half court. Drive full speed at the chair (#). Make a crossover and step through into a layup. Make 20 to each side. 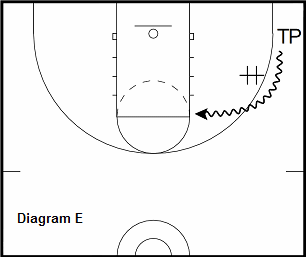 Diagram E. Parker will get screens in the corner and drive it to the elbow for a jump shot. Drill: Make 20 shots at the elbow on both sides of the court. Diagram F. TP will drive to the elbow, fake a spin move, and re-attack to the middle. Drill: Make the move at the elbow to make 20 layups. Make the move on both sides of the court. Diagram G. Tony takes a hand off at the elbow into a jump shot. 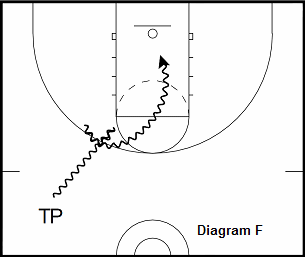 Drill: Sprint to the elbow and take the ball off the chair into a jump shot. Make 20 at both elbows. 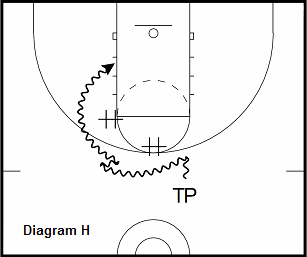 Diagram H. After coming off the pick and roll, Tony will hit the hedge with a double crossover to set up the drive. Drill: Use the chair (#) to come off the screen and hit the second chair with a double crossover. Then drive to the basket. Make 35. Diagram I. Parker drives to the elbow and spins back to the middle for a drive to the basket. Drill: Make 20 on each elbow using the spin move into a layup. Diagram J. Parker attacks the nail, bounces out with a crossover and re-attacks to the other side. 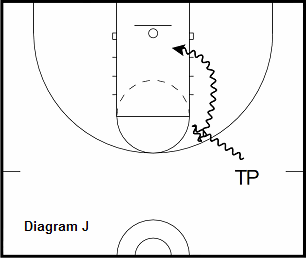 Drill: Make 20 with the move on both sides of the court.